"Books, Birds and Sky" by Linda Tracey Brandon. With a laudable number of awards and recognition galore, Artwork Archive artist Linda Tracey Brandon is an accomplished painter with much to share. 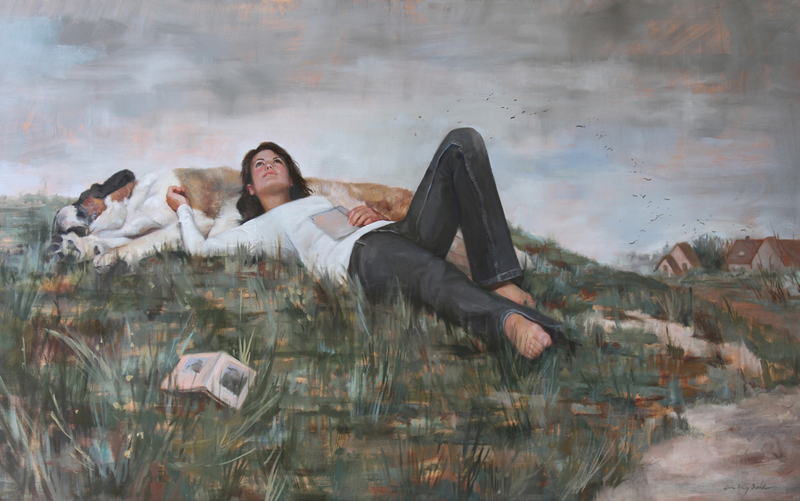 It’s no wonder Linda has given her time to the Portrait Society of America’s Cecilia Beaux Society Artist Mentorship Program as well as to teaching her craft. She could fill pages with insightful advice on building a successful art career and we were lucky enough to receive some of her tips to share with you. 1. You must have a high energy level. Do whatever you can to keep your energy level up. This means eat the right kind of foods, get exercise, and sleep. Avoid things like too much television and too much web surfing. Stay strong physically and make decisions on things to eat or to do as to whether they will give you energy or sap your strength. 2. You must have the ability to withstand stress. There are so many features of the art world that might depress and overwhelm you, so you need to develop an unshakable core. Most artists suffer considerably from financial stress and most also experience a lot of rejection. 3. You must not be afraid to fail or embarrass yourself in your work. If you’re afraid to try something new, how will you develop your own voice? 4. Success always comes at a price. Working alone is a big problem for a lot of artists and at the very least, being solitary for long periods of time can impact your personal life. 5. Don’t wait for inspiration to strike, because inspiration happens as you’re working. 6. Time flies, so don’t waste it. 7. Innate artistic talent is helpful, but not the determining factor. The same goes for technical skill and intelligence. Hard work is really important. The hard work puts you in a spot where luck can find you. 8. It is a huge benefit to be surrounded by supportive people who love you and your work and encourage you at every opportunity. It’s also true that you are the one who cares the most about your art. It’s possible to succeed without having a good support system, but it is a lot more painful. What do you wish you could have told your younger self? Tell us in the comments below.